10.4.1906: Launched by Launched by Cook, Welton & Gemmell, Beverley (Yd.No.110) for The Earl Steam Fishing Co Ltd (64/64), Grimsby as EARL HEREFORD. 18.6.1906: Registered at Grimsby (GY147). 18.6.1906: Alick Black appointed manager. Pre 1911: Fishing from Fleetwood. 14.1.1911: Inwards from fishing grounds grounded in Wyre Channel. 12.1912: Sold to Christian M. Evensen, Thorshavn, Faroe Islands. 2.1915: Sold to Sk. Halldor Kr. Thorsteinsson (1/2 share) and Hf. Eggert Ólafsson (1/2 share), Reykjavik for the sum of £5,700. Thorshavn registry closed. Registered at Reykjavik (RE157). 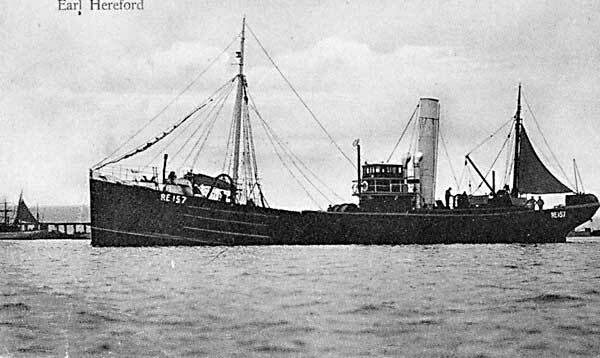 8.1917: Sold to Marine Francais for the sum of 400,000 Icelandic krónur along with nine other Icelandic trawlers (partly paid for in kind, by coal and salt, the lack of which had largely ground the Icelandic fishing industry to a halt). Employed as an auxiliary patrol vessel. Reykjavik registry closed. Renamed GUENON. 1919: Sold to F. Evan, Lorient. Registered at Lorient as PEN-er-VRO. 1925: Sold to L. Ballias & Cie, Lorient. Registered at Lorient as RAUZAN. 1936: Sold to G. Gautier, E. & A. Gautier Fils & Cia, Lorient. 1942: Requisitioned by Kriegsmarine as an auxiliary (P.No.V421). 4.6.1944: Lost during invasion of Europe. 1951: Salvaged and broken up. This entry was posted in Steam Trawlers, Steamers (Picture) on January 25, 2016 by Fred Smith.